This spacious, luxury two-bedroomed apartment in Plettenberg Bay, on South Africa's scenic Garden Route, is situated in a quiet, upmarket residential area. Airy and filled with light, it has magnificent panoramic views from the large windows which face onto the beach and lagoon. Beautifully decorated in a contemporary style with many original artworks and rugs from Turkey and Istanbul, the apartment is just 200 m from the beach and close to the Market Square shopping centre, as well as the many shops, boutiques, coffee bars and restaurants in central Plettenberg Bay. The entrance on the ground level has stairs to the upper level which houses two master en-suite bedrooms and an open plan living area with state-of-the-art kitchen, sitting room and dining area leading out onto a patio with comfortable seating. 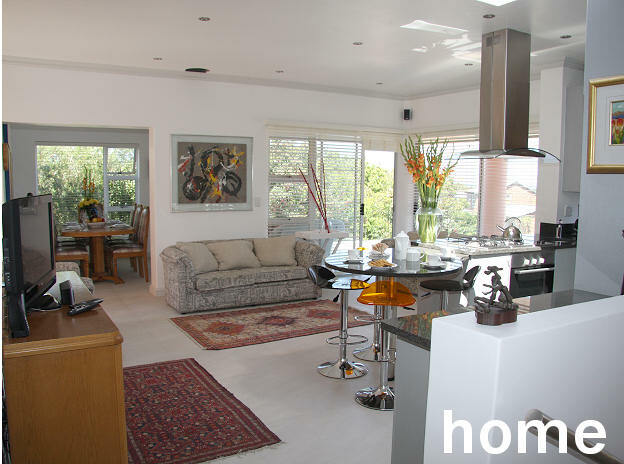 The Apartment is linked to the main house on the second level which can provide extra accommodation on request for up to six guests in three bedrooms. On the third level a vast terrace with spectacular views is ideal for sunbathing, sundowners or enjoying a barbeque. A Weber charcoal grill is provided for this purpose. Facilities include garage parking for one vehicle and generous off-street parking for others. The Apartment is the ideal base from which to explore Plettenberg Bay and the surrounding area of the Garden Route. It will comfortably accommodate two couples or a family of four. With its easy access to the beach and lagoon, it's great for beach and nature lovers. Take your binoculars to the sandy lagoon shore and do some bird watching or watch the beautiful bird sanctuary island from The Apartment's rooftop terrace. Catch an early morning glimpse of dolphins playing in the surf and, in season, enjoy the whales breaching in the bay. Guests staying at The Apartment will find that there are many water sports available on your doorstep including swimming in the warm waters of the Indian Ocean, windsurfing, canoeing and boating. If you have your own boat, you can launch this at Keurbooms Lagoon just 10 minutes drive from The Apartment.